Barn Weddings in New England are characterized by their rustic charm and stated elegance. One of the best venues for Barn Weddings in New England is Riverside Farm in Pittsfield, Vermont. Riverside Farm is an authentic, working Vermont farm that is known for its spectacular wedding events. The farm is a perfect location for a New England wedding in any season. For weddings, the farm makes use of its six renovated barns, with the Red Barn being the most popular for wedding receptions. 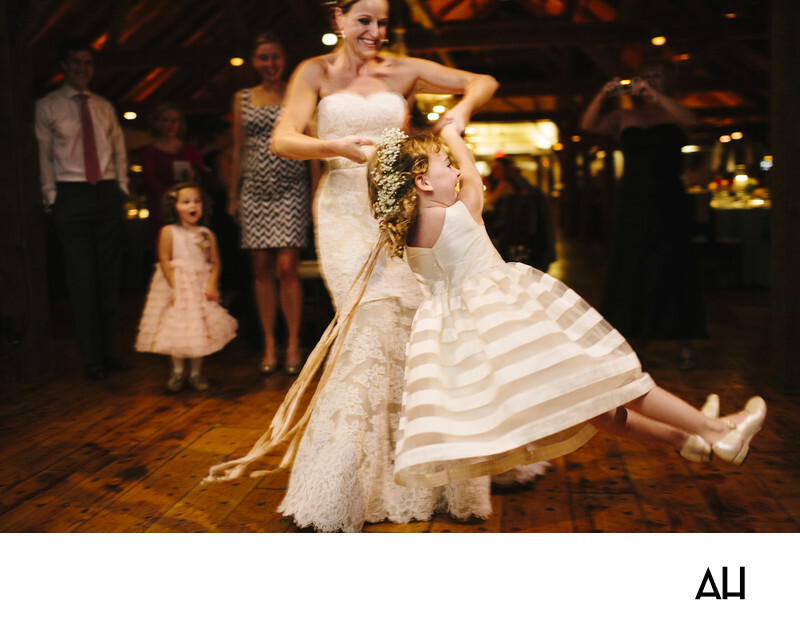 At this wedding reception at Riverside Farm, the bride dances merrily with the flower girl. The interior of the barn holding this reception is covered in stained wood and is filled with lights that give the space a romantic ambiance. The bride twirls over the hardwood dance floor in her gorgeous mermaid-style wedding gown. The gown is ivory with a layer of white lace covering it. The skirt of the gown sweeps over the floor as the bride lifts the flower girl off the ground to spin her. The flower girl’s expression is one of pure joy in this moment. The ribbons that attach to the crown of baby’s breath flowers in her hair float about the two as they spin and dance to the music that fills the room. The bride shares the child’s joy, immersing herself in the magic of her wedding day. Guests circle the dance floor, and watch fondly as the bride and flower girl move. The image the two create is symbolic of the carefree fun that was had throughout this special day.